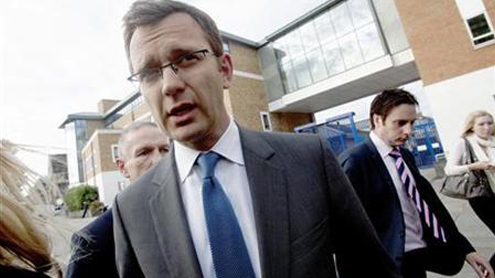 The Labor opposition and political analysts have repeatedly questioned Cameron’s judgment in hiring Andy Coulson as his spokesman in 2007, shortly after the editor quit over the jailing of his royal reporter for phone hacking. The decision to appoint a man so closely associated with Murdoch to such an important position was proof, they say, that he was desperate to secure the News Corp chief’s support. Allegations now that Coulson maintained financial links to the owner of the influential Sun and Times newspapers is likely to cause further damage. The BBC said Coulson, who was arrested earlier this year on suspicion of being involved in phone hacking, received several hundred thousand pounds from News International, the British newspaper arm of the News Corp media empire, as part of a severance package that ran in installments until the end of 2007. He also received benefits such as healthcare for three years and kept his company car, the BBC said, quoting sources. Cameron’s right of center Conservative party has long been criticized for being too close to Murdoch, although former British Labor Prime Ministers Tony Blair and Gordon Brown also openly courted the media chief. A spokesman for the Conservative Party said senior party officials had not known about the severance arrangements. Downing Street declined to comment but noted that the events occurred before Cameron became prime minister. Opposition Labor, seeking to exploit Cameron’s unease, called for transparency on the issue. “David Cameron needs to say whether he knew about the payments to Andy Coulson,” said Ivan Lewis, Labor’s culture affairs spokesman. “The details of Mr Coulson’s termination agreements with News International must be published and we need to know whether these payments, in the form of honoring a two-year contract of employment after he had been forced to resign in disgrace, were declared to the parliamentary authorities,” Lewis added. “It must be explained why Mr Coulson was getting these payments when he resigned from the News of the World. Association with the phone hacking scandal risks corroding Cameron’s reputation as he seeks to focus on major issues such as a weak economy, recent riots and the conflict in Libya. “This issue for Cameron is rotting, it is a case of a slow burn,” Ivor Gaber, professor of political journalism at City University, told Reuters. “It is not good for him, it throws a further question up about his judgment. Cameron retained Coulson as his communications director when he was elected prime minister in 2010. News International declined to comment. Coulson was specifically asked during a parliamentary committee hearing in 2009 whether he had received any other income when he worked for the Conservative Party, and said no. “So your sole income was News International and then your sole income was the Conservative Party?” parliamentarian Tom Watson asked. “Yes,” Coulson replied. Labor MPs said authorities should look into the payments. “In effect the Tory (Conservative) party received a massive subsidy which they should have declared to the Electoral Commission,” said Chris Bryant, who has played a prominent role in pursuing the phone hacking scandal in parliament. “It just shows how culpably gullible Cameron was in taking Coulson on. He failed to do due diligence because he was so sickeningly keen to please the Murdochs,” he added. Employment lawyers said Coulson appeared to have negotiated a very good deal. Cameron has said he now regrets appointing Coulson and will apologize to parliament if it turns out that Coulson lied over how much he knew. Coulson finally quit his government job earlier this year when police further investigated the hacking allegations. He has since been arrested by police, along with several other former employees of the paper, and is facing questions over what he knew about the phone hacking, which was used to secure stories.